In 2013 My son was diagnosed with thalaseemia major for which he has gone through Bone Marrow Transplantation (BMT) in 2014, at Apollo speciality hospital, chennai.In Jan'15 he had chronic GVHD (Graft Versus Host Disease) as Auto immune hemolytic anemia, for which he was treated with many costly antibiotics for three months.After that from May'15 he got severe fungal infection in sinus and blood disorder for which he is admitted at Apollo Speciality Hospital, Chennai and getting anti fungal medicines which are very costly. Doctor has provided cost estimate of Rs 10/- lacs for treatment of infection and blood disorder. I have already spent huge amount (as mentioned below) on BMT and now not in a position to arrange such a huge cost of Rs 10/- lacs for treatment of infections and blood disorder. Therefore, request your goodself to kindly provide financial assistance of Rs 10/- lacs so that post BMT GVHD and infections can be treated and his life can be saved. I hope you all are fine. I like to thank you all once again for your support and blessings for my son. He is fine now but still on medicines. Thanks to Milaap from the bottom of my heart. Thank you all! Thank you so much for your support and blessings for my son's treatment and health. Rhythm is recovering from his problems by the grace of God and supporters like you. Thank you very much for your blessings. I can't forget your support and prayers. Thank you is very small word to say. I would like to request you to please continue the support and blessings for my son's health. Thank you once again to all supporters and Milaap Team. My son Rhythm Agarwal 3 years old had thalassemia major for which he had undergone unrelated stem cell transplant with fully match donor in June 2015. He was on steroids due to gut GVHD.In this January his steroids were slightly reduced due that his counts started falling very drastically. After doing many test like Hb electrophoresis,direct combs test,Ldh,donor chimerism,reticulocyte count it was diagnosed that he developed chronic Gvhd as autoimmune hemolytic anemia with 100%donor. For which he was treated with Ivig and heavy doses of steroids but there was no improvement in his counts. As because of low platlets it started bleeding. Doctor has given 3doses of rituximab injection and reduce steroids and it works and his counts started improving. As rituximab is very heavy dose of immunosuppressant he got infection like heavy viral load in the body and again his counts were falling and he became very sick. As there was no way doctors had given him Ganciclovir injection to control cmv viral load in the body and again by the grace of God it worked and his condition has improved but counts were still not coming up because his autoimmune had not settle down. Then doctor given him 3doses of bortinib injection and as our always hope his counts were improved. But due to so many immunosuppressant medicines as our bad luck he developed fungal infection in his sinus in this May for which he was admitted in hospital for 25 days , followed by endoscopy 3 times to remove his fungus. He is only 3 years old doctors can't remove his fungus deeply and given high antifungal medicines like lambin and Cancidas. His fungal infection was in control. In this June he got very rare type of autoimmune as subcutaneous fat necrosis in his skin , which is very painful. Doctor has tried a lot to settle his disease but nothing worked.Now the challenge is to get the autoimmune into control. So,now again we have to go through all the heavy medicine to control cgvhd as autoimmune hemolytic anemia as well as thrombocytopenia and subcutaneous fat necrosis. From this January to June we have spended lot of money than our capacity for his one by one problems because we can't let him go because of financial problems. 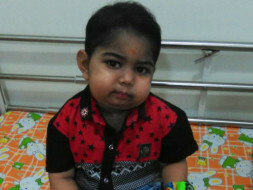 We want to cure him till the last hope and for which I have started raising funds. We have hope that all supporters help will give my child a new life. So,I request all the supporters to come forward and help us meet the treatment cost.